There’s nothing quite like a child’s first experience with live theater. Although it has been two decades I still remember my first show clearly; it was Brigadoon at Beef & Boards Dinner Theatre. So it was especially meaningful to get to take my nephew to his first show at the same theatre this past weekend and The Wizard of Oz provided the perfect introduction to world of musicals. Fans of the Church Basement Ladies shows will recognize Dorothy, played by Lisa Bark. 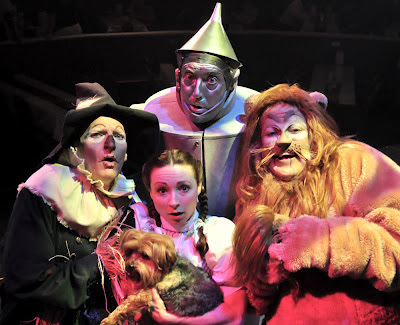 Her fresh-faced innocence is just right for the role and kids will love the fact that she’s accompanied throughout the show by a real dog playing Toto. The rest of her gang is made up of B&B favorites like Doug King as the rubber-bodied Scarecrow, Jeff Stockberger as the cardiac-challenged Tin Man and Jayson Elliott as a Lion that’s all roar and no bite. Young audience members can’t help being delighted by the trio as they help Dorothy on her way. 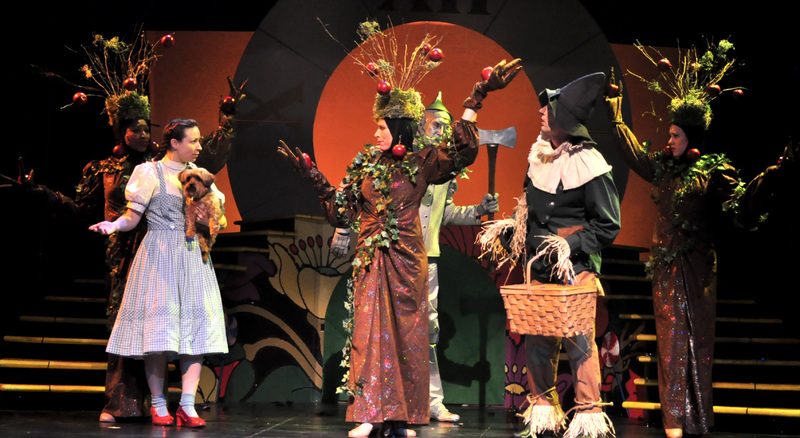 Lynne Perkins clearly has a blast playing the Wicked Witch of the West. She cackles and shrieks with menacing glee in every scene and embraces the pun-littered dialogue with gusto. Eddie Curry also does a great job as the blustery wizard. Costumer Jill Kelly outdid herself in this production. Everyone from the Munchkins (all played by Central Indiana kids) to the Wicked Witch is beautifully decked out. The apple trees in the Land of Oz are particularly lovely. The Wizard of Oz is a wonderful treat or families. Take your kids, nieces, nephews or grandkids to see it and inspire a new generation to kindle a love for live theatre! Seeing the show through their eyes will give you a new appreciation for the magic of live theater! Performances: The show runs until July 15. Doors open for evening performances at 6 p.m. Tuesday through Sunday. The buffet is served from 6:30 to 7:30 p.m. and the show begins at 8 p.m. For Wednesday matinees doors open at 11:30 a.m. and the buffet is served from 11:45 a.m. to 12:30 p.m. The show begins at 1 p.m. For Sunday matinees doors open at 12 p.m. and the buffet is served from 12:15 to 1 p.m. 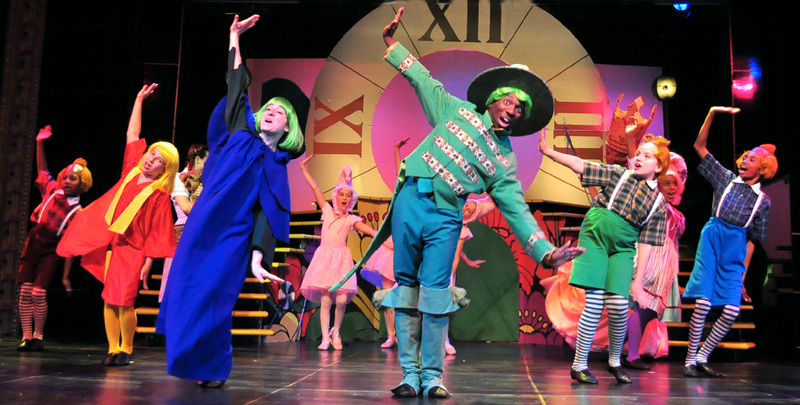 The show begins at 1:30 p.m.
Tickets: To purchase tickets call (317) 872-9664 between 10 a.m. and 7 p.m. Prices range from $37 to $60 and include the show, tax, coffee, tea and the buffet. As Beef & Boards’ 2012 Family Show, this production offers a $10 discount off tickets for kids ages 3-15. This production offers discounts; call the box office for more details.